So it is football season and the games are on Saturday and Sunday at my house. We love to have just a relaxing day hubby watching the game, I work on a craft project or organize my coupons, and the kids are in and out playing in the backyard. On those days I do not want to cook a full meal, but love having appetizers around all day. Everyone can come in the kitchen and pick and choose when they are hungry. These Kielbasa slices are right up our alley. You can brown them, toss them in the crockpot and snag a couple when you get hungry. These would be a great appetizer for a party too! 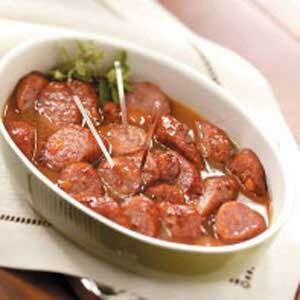 In a large skillet, brown sausage; drain and set aside. Add the sausage and the remaining ingredients to the crock pot and cook over low heat for 3 hours (or high heat 1 1/2 hours) or until heated through.